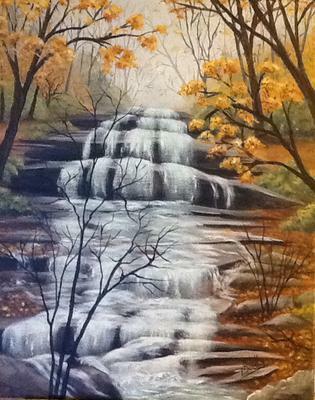 Well, I got brave enough to try painting Pearson Falls, the actual falls. Critiques welcomed. I loved the falls. The sounds, smells and atmosphere. It was so thunderous. I was just amazed. I hope I did it justice. Hi Linda - you've done a really good job with this painting. Beautiful choice of colours, nice sense of recession into the distance and the water is definitely tumbling down hill. Looks like cool, clear water too!